#305 Comfy Studio Suite w/balcony. Walk to Lifts. This Studio Suite at The Powderhorn can accommodate up to 3 people. It offers a king sized bed and a double sized sofa bed. The Studio Suite offers a mini-kitchen (granite counter-top, mini-refrigerator, convection microwave, single burner induction cook top, dishwasher, sink, coffee maker and toaster), telephone, satellite television with HBO and wireless internet. This Studio Suite has an exterior balcony facing the lower ski slopes and the village center of TSV. 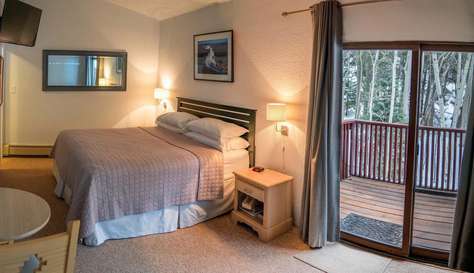 This Studio Suite is great for couples or small families looking for value in the main base area of Taos Ski Valley.